Dar Si Hmad has been running a #16Days Campaign in conjunction with the United Nations’ 16 Days of Activism against Gender-Based Violence. We’ve highlighted various programs emphasizing women’s and girls’ empowerment. Dar Si Hmad’s educational programs are particularly relevant, as this year’s theme from the global campaign coordinators asks us to “Make Education Safe for All!”. Along with the United Nations and the 16 Days Campaign, Dar Si Hmad believes that we can move “From Peace in the Home to Peace in the World”. For urban youth in Agadir, international educational opportunities are fairly limited. Studying abroad is an attractive idea, but financial, linguistic, and logistical (including the challenge of acquiring visas and passports) barriers are high. Sponsored exchange programs are important avenues that can help support driven students in their dream of enhancing their educational experiences and sharing their perspectives with young people in other parts of the world. Yesterday, Dar Si Hmad held an application support workshop open to everyone interested in international exchange programs. The workshop boosted Agadir youths’ awareness of these opportunities and gave them individualized help in compiling CVs and writing personal statements. Dar Si Hmad’s Office Manager Maourane Smaili has been granted a Fulbright Scholarship for study in the United States next year. Marouane kicked off the workshop with an overview of some available opportunities and some reflections on his own experience applying for the Fulbright. 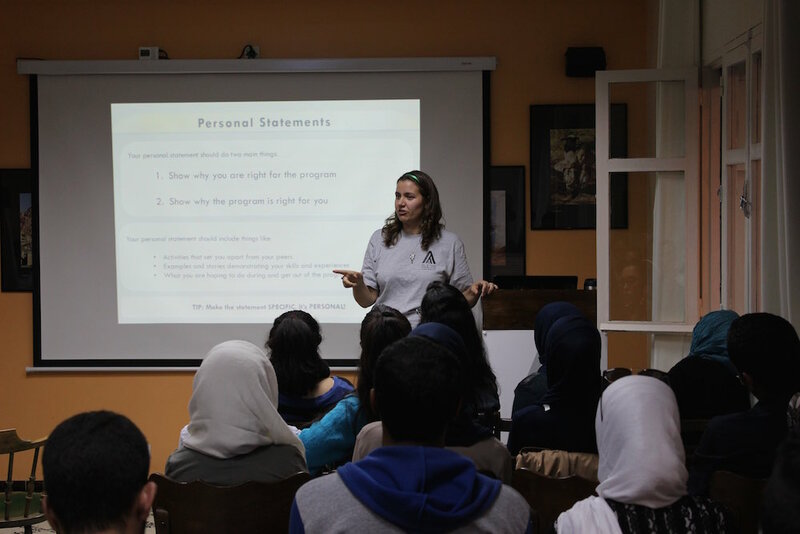 Marina's talk focused on the importance of civic engagement, leadership, and community service, three things that our MEPI-funded RISE Program is focusing on in its efforts to enhance the capacity of Agadir youth. We were lucky to have with us two alumni of international exchange programs. Participants from the MEPI Student Leaders Program and the Swedish Institute’s Young Leaders Visitors Programme shared stories about their time in America and Sweden and tips about the interview process. All three of our exchange program-accepted speakers were men - demonstrating that we have some work to do in better equipping young women to take on these travel and study opportunities! Ensuring that just as many women participate in these programs as men is vital to building better understandings of Moroccan culture and diversity for communities abroad as well as enhancing gender parity around the globe. Becca Farnum is a visiting researcher from King’s College London. She took time out from collecting data for her PhD to talk with the students about what goes into a good personal statement. Becca encouraged the students to think about what sets them apart from their peers. Personal statements should be exactly that - personal! Dar Si Hmad staff members' top tips focused on using stories to creatively highlight your skills and passions in a personal statement. The Swedish Institute Study Scholarships, funding opportunities for year-long master’s programs in Sweden. Students can find more information about these programs via the links above and through Dar Si Hmad's presentation from the workshop, available here. The presentation also includes tips for how to write a good personal statement. After the presentation, participants split into small groups to brainstorm and/or edit their personal statements. The personal statement is one of the most important parts of an application for exchange programs and offers a great chance for students to reflect on the work they have done and why it matters to them. Student exchange programs are a powerful way to empower young people and build global peace and understanding. We talked earlier in this campaign about Dar Si Hmad’s Ethnographic Field School and its role in breaking down violent stereotypes and misconceptions about Morocco. But for true cross-cultural exchange to take place, the relationship has to go both ways. International exchange programs allow Moroccan youth to go abroad, making them ambassadors for their communities on the global stage. Dar Si Hmad believes this work is critical to both individual youths’ empowerment and to sustainable futures. Education builds peace. Cross-cultural exchange builds peace. Learning together and engaging with each other are vital to building a more peaceful and just world. Good luck to all of those applying for these programs – Dar Si Hmad is proud to be able to offer support to those from the Agadir region!